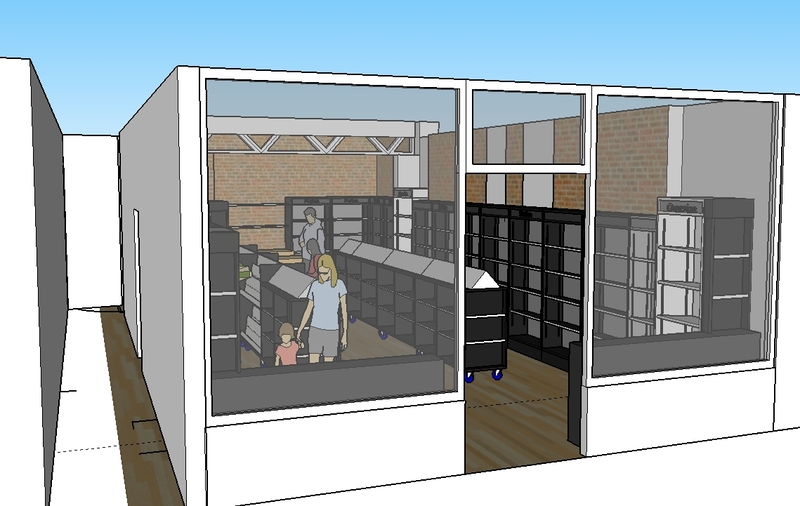 Page 45 Evolution Announced: Brand-New Shop Floor AND Front! Are you excited? We are beside ourselves! And it is going to be glorious! THERE HAS BEEN A DELAY! OUR PRIMARY BUILDER IS HOSPITAL-ILL! ALL THAT FOLLOWS WILL STILL HAPPEN, BUT THE DATES WILL INEVITABLY BE DIFFERENT! Meanwhile we trade as normal from our ever-gorgeous shop floor and website at www.page45.com while we wait for our new dates to surface! Hooray! October 2015: on our 21st Anniversary, Page 45 bought its entire building. 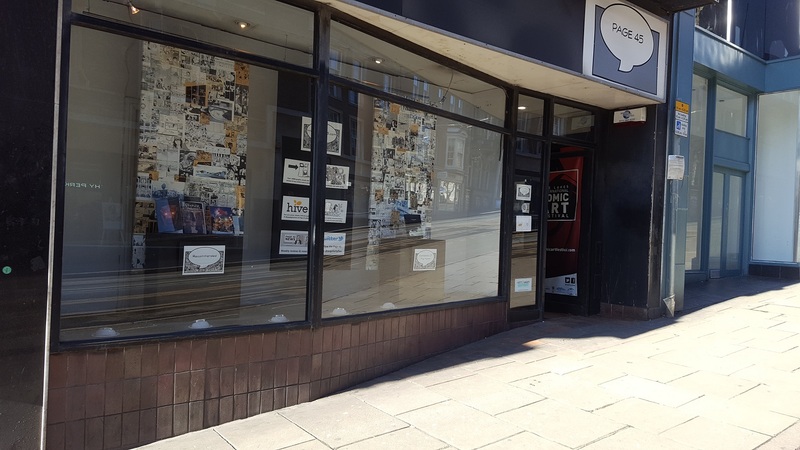 Ever since when we’ve been planning this physical restructure – a complete regeneration which will be sharper, sleeker and even more chic – so that more graphic novels can be displayed face-front on our ground floor, and lit like radiant stars. Because TBH our lighting has always been shocking. There will be no pause in service: not one single day. That is vital, for you cannot forego your regular, hallowed comics fix! New Comics Day will remain Wednesdays. Restocks will arrive 5 times a week as always. There will be no break in your Page 45 Standing Orders, their immediate dispatch worldwide via www.page45.com or their availability to you for collection. How will we do this? Because, best beloveds, we have prepared! 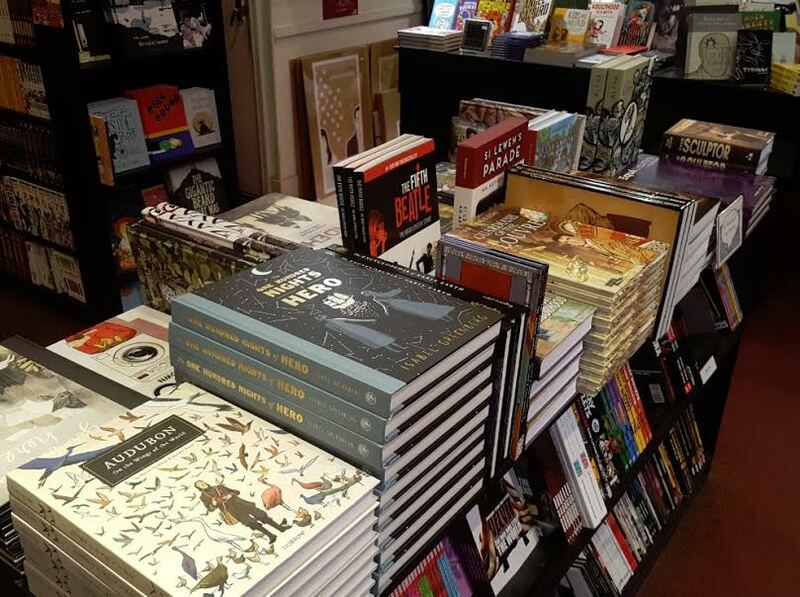 Page 45 will trade as normal until 4pm Sunday 18th February at which point the original shop floor will vanish forever in its entirely. Please flock along before then to buy lots of books and take commemorative photos! I certainly have! Page 45 will reopen the very next morning at 9am, on Monday 19th February in the ground-floor unit immediately to our right of where we are now. Page 45 will then also reopen upstairs through new a door to our left on Thursday 22nd February once those new stairs and door have been built. Hey, it’s takes three days! So as well as being open worldwide at www.page45.com, that’s two temporary trading locations for three and a half weeks. Wheelchair users, please see FAQ below: upstairs is temporary! 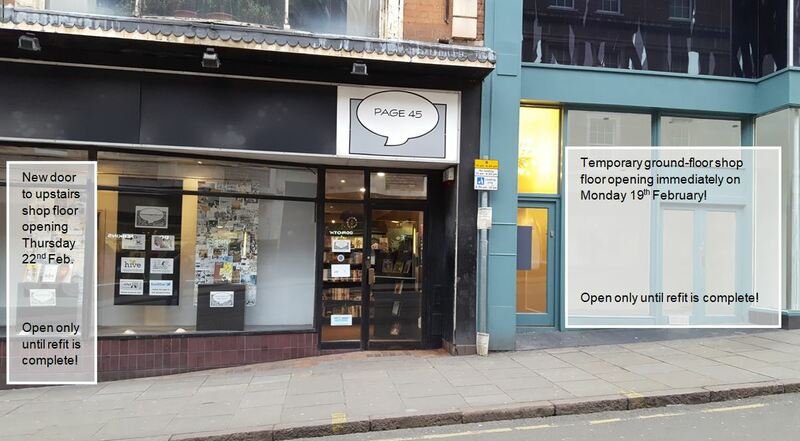 Page 45 will finally reopen in full, blazing glory on Friday 16th March 2018 at our current ground-floor location of 9 Market Street with every single fitting brand-new. Or a little earlier if we can. I won’t lie to you: there are risks involved. During the transition period we will be vulnerable to: a) people suspecting we’ve closed for good, in spite of all our signage, b) I don’t know – going bankrupt…? We must keep making money, please! Please spread news of this blog as widely as possibly. That is me publically begging for retweets, tweets of your own and Bookface postings, linking to this blog, the most important that I’ve ever written. Why not pop along to Instagram our extemporised action, and join in our wartime spirit! 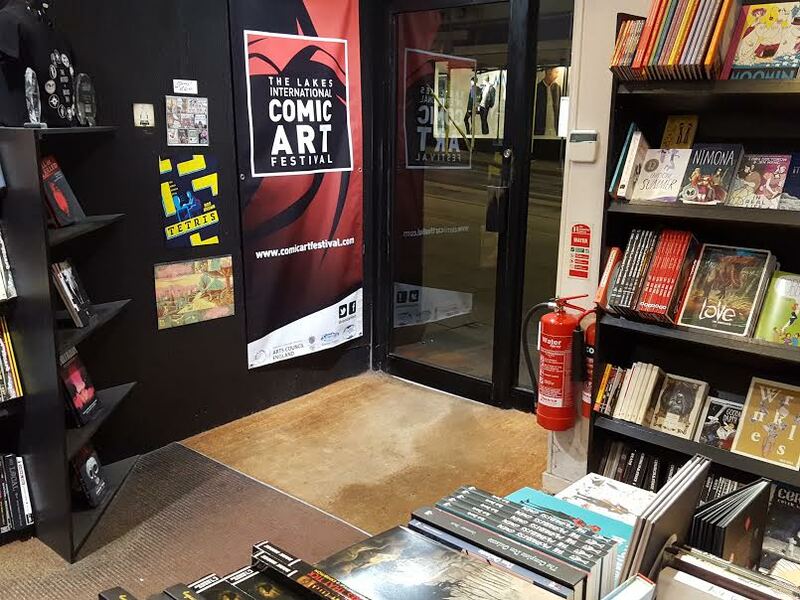 Please keep visiting our temporary shop floors for our full range of comics and graphic novels, and ask where we’ve housed what! Please don’t wait for the new shop floor. You’ve got to wonder what our temporary accommodations look like, right? Also, if we may, an immediate small call to alms (arf! 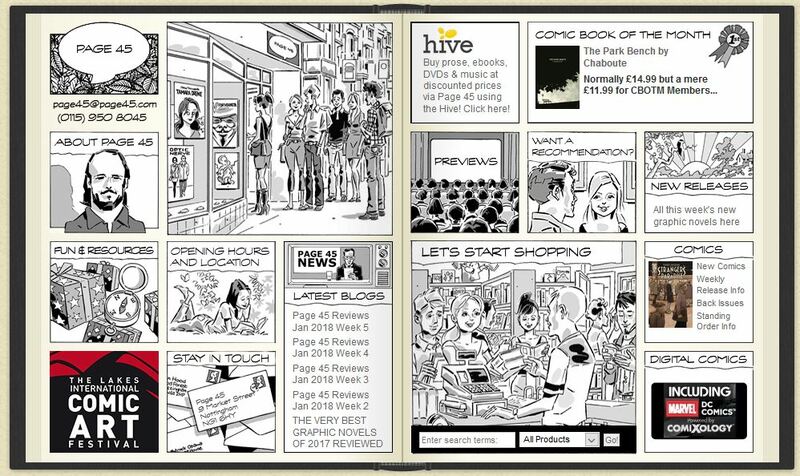 ): if there’s a graphic novel or two that you’ve been meaning to buy, either for yourself or someone else, why not pop along to www.page45.com and purchase it right now, either for shipping or collection in store. That would be incredibly helpful and extremely generous of you. Thanks! If you’ve nothing in mind but you’d like some ideas, please read our Christmas Best Of 2017 blog or perhaps peruse past Page 45 Comicbook Of The Month selections (click on any cover in grid for reviews). Thank you! There may be updates – even to this blog – because Acts of God. As soon as we begin this renovation, then we will start posting photos of extreme farce on Facebook, Instagram and Twitter @pagefortyfive. It’s a big story, right…? And your future’s involved! Will we reopen in time…? I do not know! Why? To make comics look even more attractive than they already are to brand-new, potentially life-long readers, as well as loyal veterans like you! Are all these dates guaranteed? No, but we’ve planned extensively for two whole years and given ourselves a little wiggle room on top. 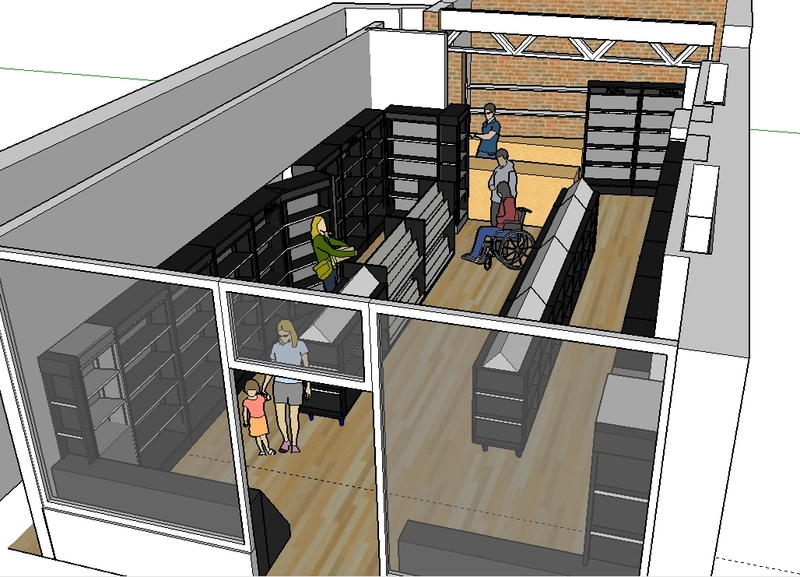 Don’t you feel awful that only half of your comics will be easily accessible to those in wheelchairs for 3 whole weeks? No. Folks, it’ll be 3 short weeks versus my personal, career-long commitment to access for all, ever since I first drew up the Page 45 Business Plan 24 years ago. Other shops would have opened upstairs or downstairs years ago. We never will. 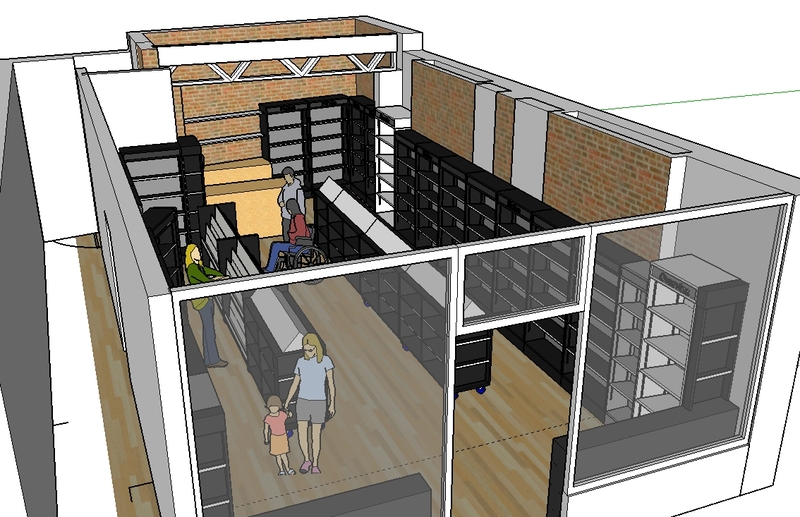 Our upstairs floor is only temporary and will close as soon as our ground floor reopens. 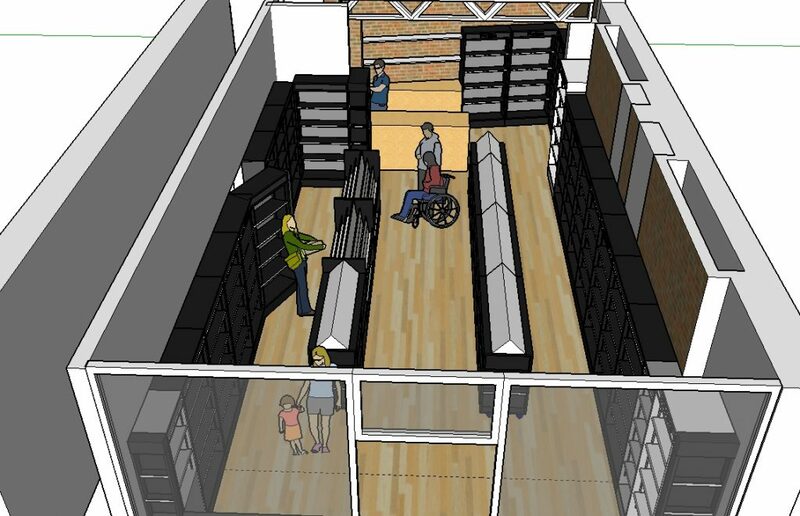 Wheelchair users: For three weeks, please sweep into our temporary ground-floor location and we will arrange to have whatever you need from upstairs brought down, even if you just want to browse through it: no pressure to buy anything at all. This section may well expand depending on what I’m asked, post-publication, on Twitter! When we crawl from this wreckage, gasping for air then gawping at the sheer majesty of the new, evolved Page 45, please remember that it was meticulously researched, planned and designed in its entirely by our very own Jonathan Rigby, co-owner and co-manager of Page 45, with Colombian architect Julie Waldron who created the 3-D model from which I’ve taken screenshots for you. All I had to was watch, listen and learn, before signing off almost instantly, because each individual element of this new design is an exceptional improvement completely in keeping with the long-term goals and aesthetics of Page 45. If in any doubt, I would remind you that it was our Jonathan – alongside Random River’s Chris Dicken – who gave us Page 45’s international website www.page45.com which Kieron Gillen of THE WICKED + THE DIVINE memorably described on its launch as “crushworthy”. This too will be the most monumental upgrade. I’ve only shown you bare bones of the beauty so far. But in the meantime, if you’re excited and believe in Page 45’s goals for comics and graphic novels, please spread this message as widely as you can. And, with your help, we’ve only just begun! This entry was posted on Monday, February 5th, 2018 at 12:53 pm	and is filed under Various, Letters & Other News. You can follow any responses to this entry through the RSS 2.0 feed. You can leave a response, or trackback from your own site.